No, you're not experiencing déjà vu — you might be remembering that Nate Berkus and Jeremiah Brent actually launched a capsule collection for Living Spaces last October. Now, they're back again to introduce us to three new collections: Galerie, Gramercy, and Pavilion. These pieces — which were designed with the capsule collection simultaneously — feature a variety of dreamy materials, finishes, and textures in neutral color palettes designed to mix and match beautifully with one another as well as the capsule collection. "We want people to feel empowered to mix and match and create their own version of what we've done, but in order to do that you have to have a through line, so you have to make sure that the scale of things looks well with one another," Nate Berkus tells Hunker. 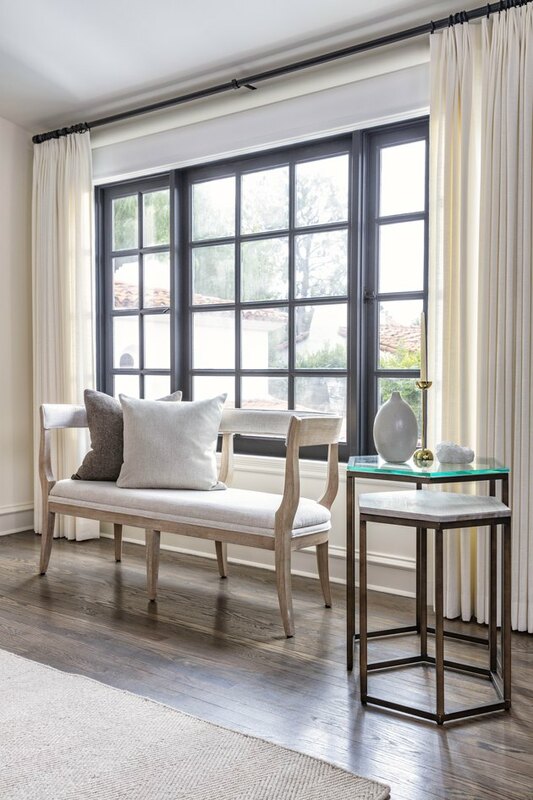 "I think the thing that we really tried to do is introduce versatility with everything ... We tried to introduce as many materials and finishes with every piece so you really felt like you were buying a piece of furniture, it didn't just feel temporary," Jeremiah Brent adds. "And the pricing is so affordable that we had an opportunity to really kind of weave a different story for affordable furniture, that you don't have to break the bank and that you don't have to get rid of it in a year. Some of these pieces we're hoping you still have for 10 plus years because the quality is so good." And with prices ranging from $39 to $2,795, there really is something for every budget. If you're thinking: There's no way that this uber-busy, ultra-stylish powerhouse couple and parents of two little ones really has time to design all of this stuff. Well, you'd be 100 percent wrong. We're not quite sure where they find the time or energy, but when we asked Nate Berkus about their design process, he explained, "So, it started with research, it started with history. It always starts as well, concurrently, with travel and what we see when we're wherever. Our phones are filled with photos of details, and drawer hardware, and bookshelves, and dining chairs that we've run into whether we're in Rome, or in the Yucatan, or in Vietnam, it doesn't matter. And we've had a really good time sort of honing that imagery down and then starting the drawing, starting the sketches, factory visits, finish approvals, fabric approvals — it's been very, very, very hands on ... it's been like having a third kid." The drawers built into this table are the perfect dining room storage solution. 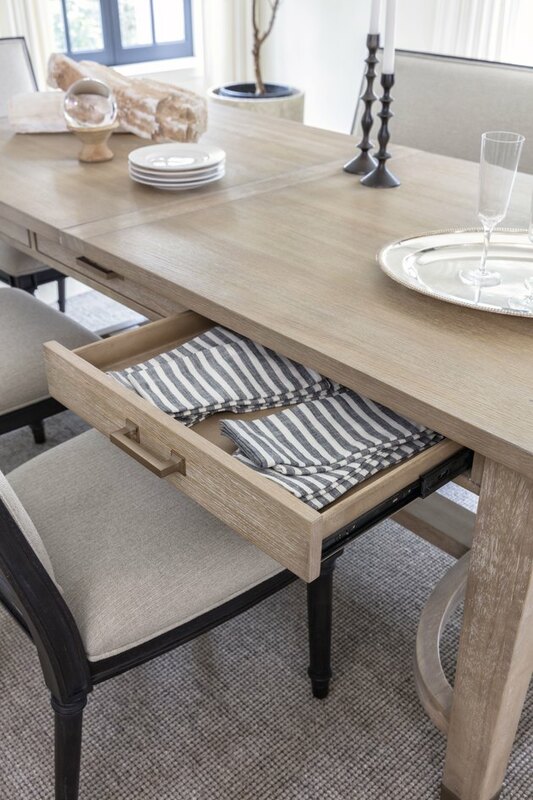 Stash fancy napkins, placemats, or tablecloths out of the way, yet close enough for easy access when you need them. Turn a window into a reading nook or mix and match your dining seating, either way you'll be sitting pretty on this bench. Talk about office goals for small spaces. This secretary desk has everything you could possibly need in one compact, elegant piece of furniture. 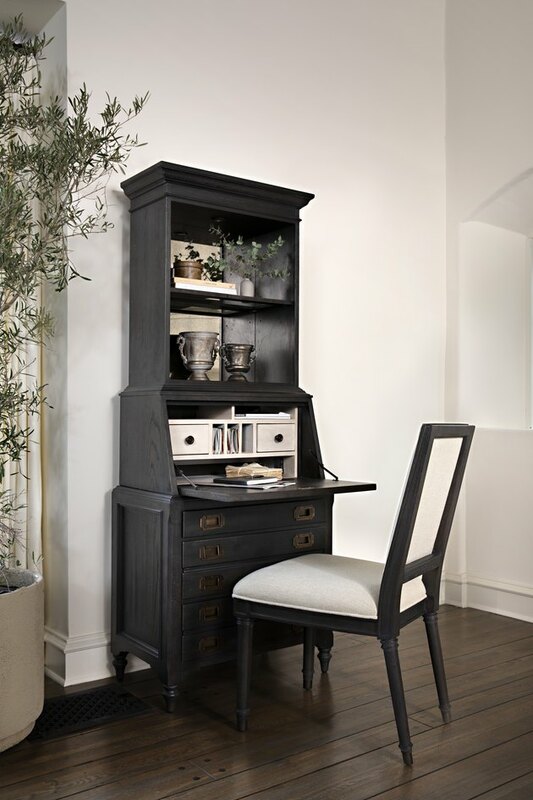 Including antique mirror, bronze hardware, plenty of storage, desk space, a USB port, and an LED light, this piece of furniture is the complete package. And you didn't hear this from us, but this piece happens to be Nate Berkus' fave, too. 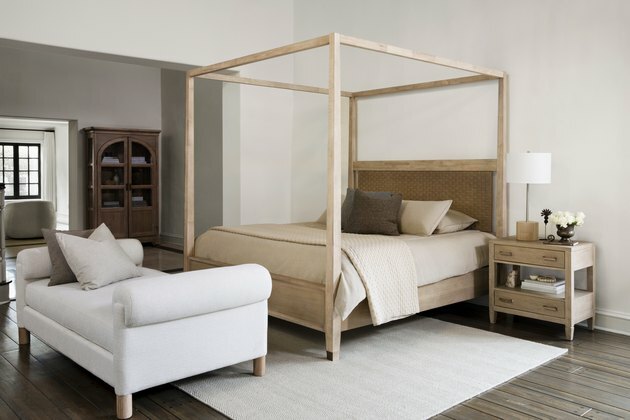 Sweet dreams are definitely made of this canopy bed. If you have the space, why settle for one coffee table when you can enjoy three? Live your best life and consider these nesting beauties. If this living room scene isn't picture-perfect proof that curved furniture is in, we don't know what is! OK, so we're pretty sure this clever lift-top coffee table will make bingeing Game of Thrones so much better. Or at least fellow GoT lover, Jeremiah Brent, thinks so — he picked this piece as his top choice.